Jonah Berger is a Marketing Professor at the Wharton School at the University of Pennsylvania and a world-renowned expert on word of mouth, social influence, consumer behavior, and how products, ideas, and behaviors catch on. He has published dozens of articles in top‐tier academic journals, and popular accounts of his work often appear in places like The New York Times, Wall Street Journal, and Harvard Business Review. 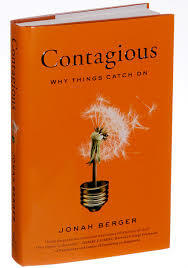 Berger’s recent book, Contagious: Why Things Catch On is a New York Times and Wall Street Journal bestseller and hundreds of thousands of copies are in print in over 30 languages. Berger is a popular speaker at major conferences and events and often consults for companies like Google, Coca‐Cola, GE, Vanguard, Unilever, General Motors, 3M, Kaiser Permanente, and The Gates Foundation. New York Times bestseller and named Best Marketing Book of 2014 by the American Marketing Association. Check back later for some content here. Thank you!